Sustainable Dance Floor | MOUSE MARKETING INC. GENERATE ELECTRICITY WITH HUMAN MOVEMENT! The Sustainable Dance Floor is the world’s first energy dance floor that converts kinetic energy of dancing people to electricity. It’s an innovative experiential marketing tool that engages and energizes people. This dance floor uses human movement as source of energy. This kinetic energy is converted to electricity which powers the floor’s LED lights. The floor interacts with the public and involves them in an interactive energy experience. The generated electricity can be used to power one of our Energy Plugins, like our digital energy meter, photo application or LED battery. 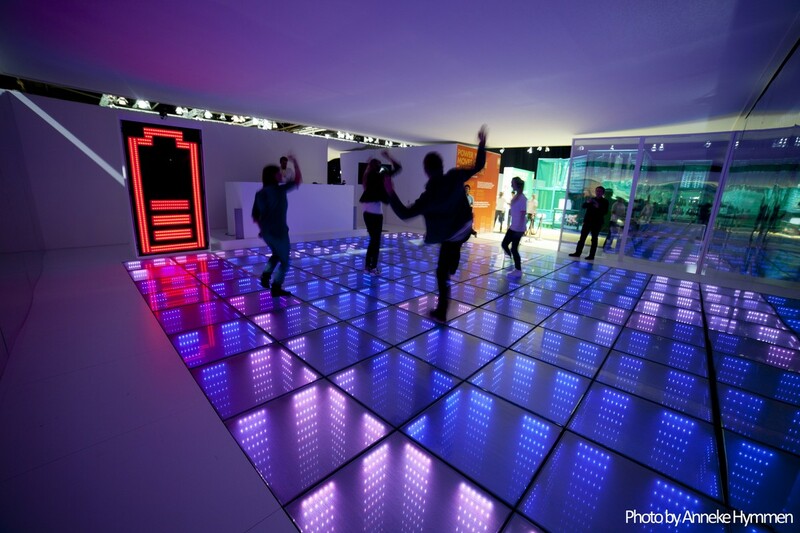 Another possibility is to power your own customized brand experience with the generated electricity on the dance floor. The Sustainable Dance Floor can be installed in different shapes and for various occasions, worldwide. Projects range from major sports events, festivals, product launches, corporate events and pavilions, to club tours, trade fairs, science centre exhibitions and auto shows. We have a track record of producing brand activations worldwide and worked with many different brands activations and campaigns. The Sustainable Dance Floor modules flex slightly when stepped on. Inside each tile is an electromechanical system, which transforms the small vertical movement produced by dancing people into a rotating movement that drives a generator. Each module by the size of 75x75x20 cm can produce up to 35 watt of sustained output. Between 5-20 Watt per person. Now that’s how to put your foot forward positively.